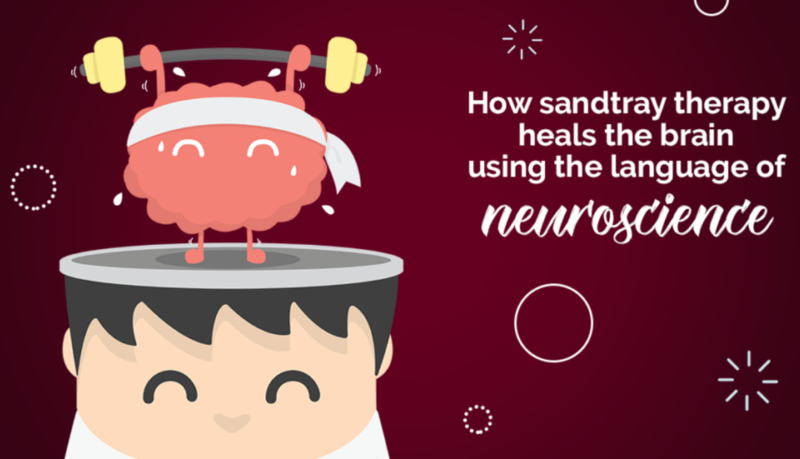 What is Sand Tray Therapy? 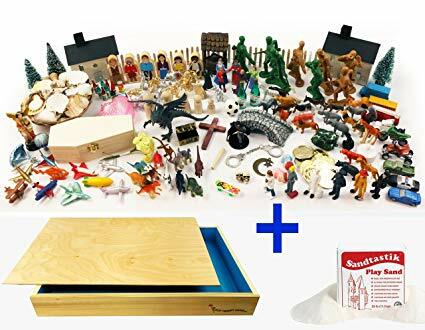 Sand tray therapy allows a person to construct his or her own microcosm using miniature toys, figurines, and objects in the sand in any way they choose. The scene created acts as a reflection of the person’s own life and allows him or her the opportunity to resolve conflicts, remove obstacles, and gain acceptance of self. 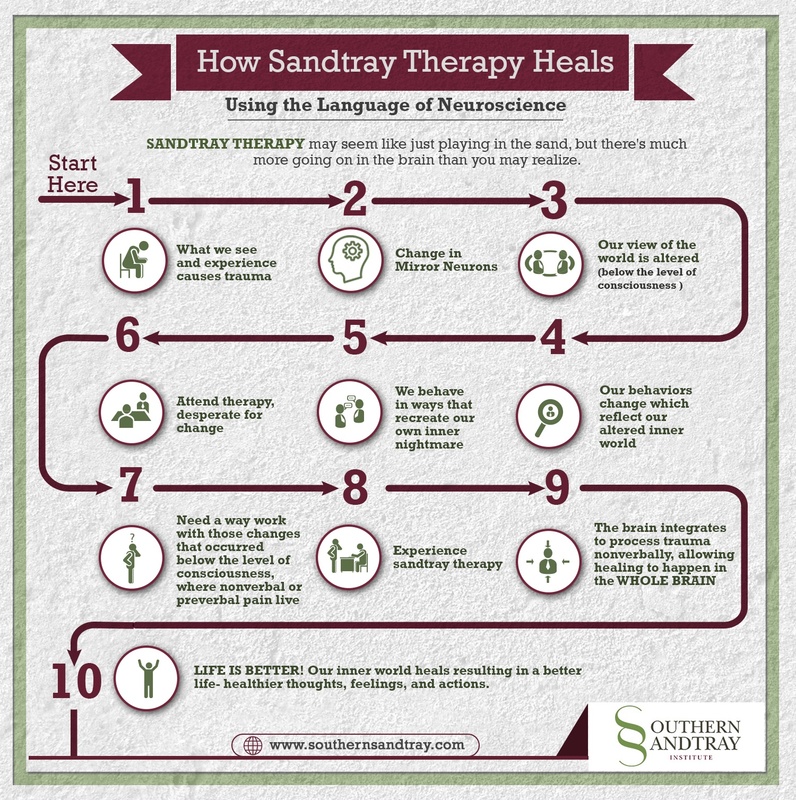 A common strategy applied in sand tray therapy is the humanistic approach in which therapists rely heavily on the client to find solutions to their problems, using the sand as a tool for healing. 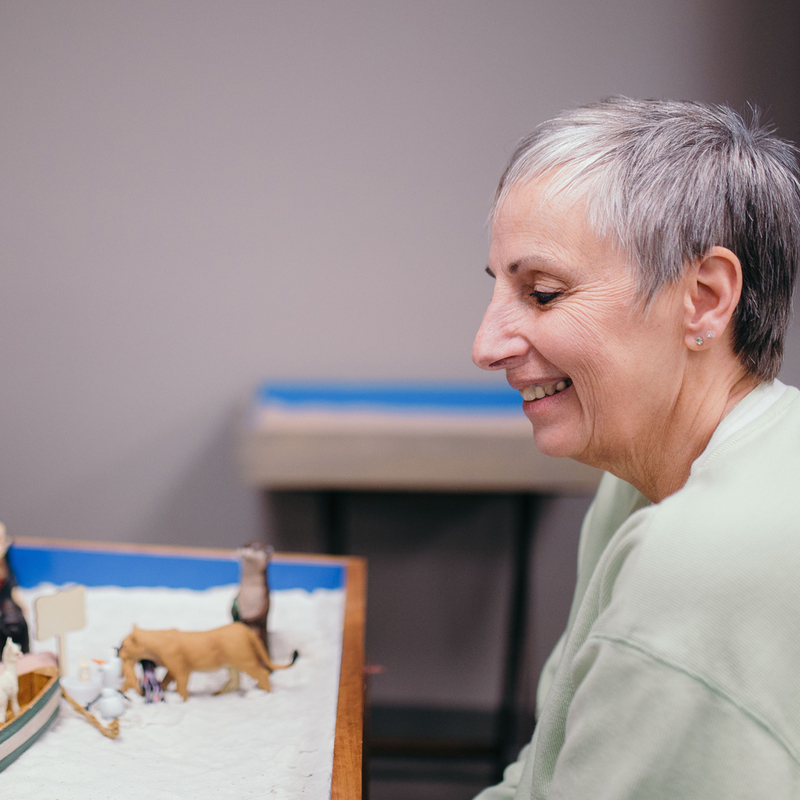 Through creative expression, a person in therapy is able to manifest in sand the things they would otherwise not be able to vocalize or address in traditional therapy. 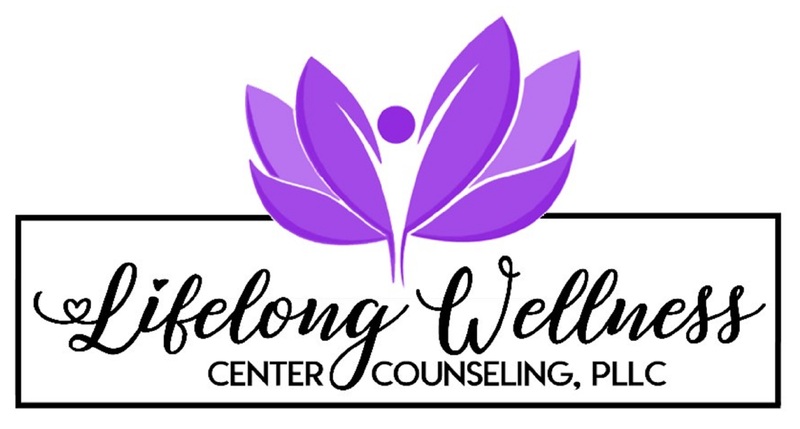 The therapist treats the person as whole and healed, knowing that the process of sand tray therapy allows the person to find the answers that are already within them. Children and adults are free to explore the variety of figurines and toys and are encouraged to position and reposition the miniatures in the sand, using the sand to sculpt and mold their world. 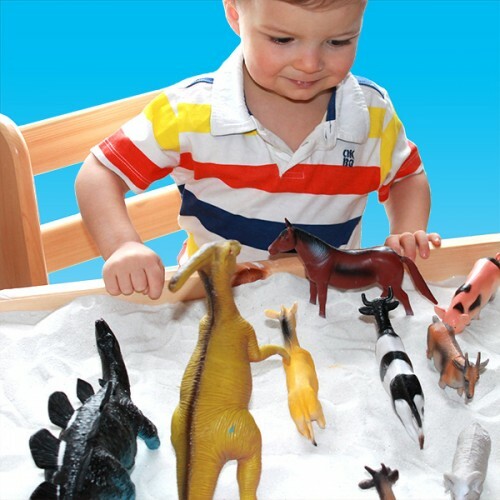 At the end of a session, the child leaves with an intact image of the scene created while the therapist documents the scene to provide a developmental history of the sand tray process. 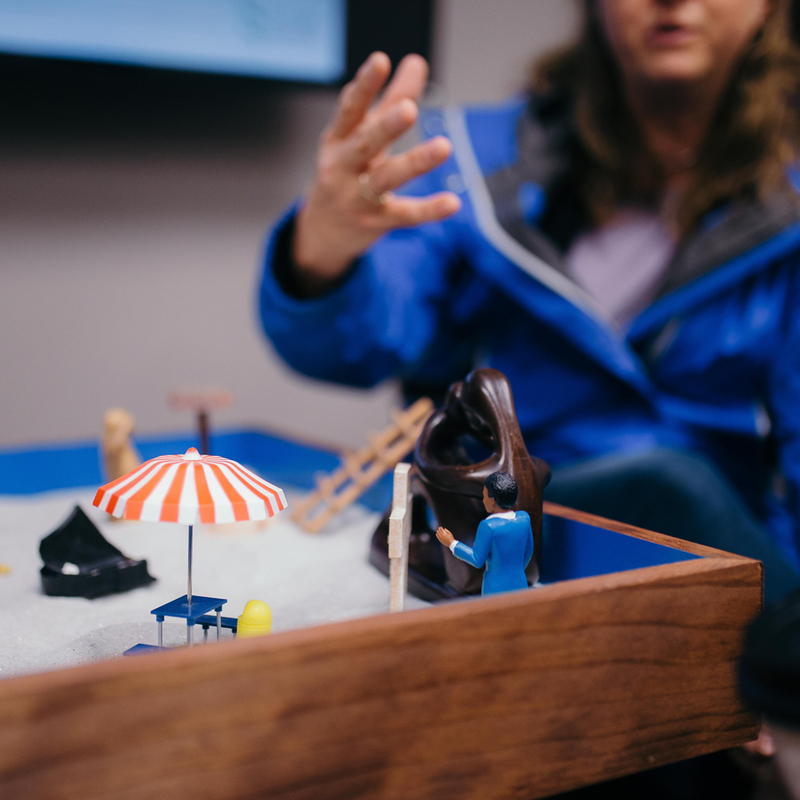 Sand tray therapy provides a method of communication and discovery that is beneficial to those individuals who do not respond to more traditional forms of therapy, or for children who process best by play-based approaches. Many children (and adults) are unable to verbalize emotional states, particularly in the form of trauma, neglect, or abuse. Adults who have been traumatized and show limited response to other forms of therapy may respond well to sand tray therapy. The environment presents an atmosphere free from threats, and the therapist works with the person in therapy to alter the positions of the miniature objects as representations of the true people and events. By beginning to facilitate change on a fictitious level, a person can gain the courage and ability to recognize that these same changes can be made in his or her own life. Children are immediately drawn to the sand tray and miniature figures, and the cool sand in their hands provides a calming effect. Many adults can also relate to playing in the sand during childhood. The act of building the world, scenes, or stories facilitates the process of healing and encourages growth. If one asks a child to describe his or her problem, or why they display a specific behavior, most likely the child will be unable to answer because children do not possess the words or understanding to verbalize an answer. When given a sand tray, children can unconsciously process their problems and behaviors. The non-verbal nature of sand tray therapy and the familiar medium of sand can help children achieve feelings of comfort and security. With little direction from the therapist, the child is free to play and develop his or her own expression of situations. Oftentimes, children will experience a sense of independent play and will begin making assumptions and behavior changes without cues from the therapist. This method of therapy serves as a valuable and powerful outlet for children and an incredibly insightful method of gaining access to traumatic experiences. Sand tray therapy is also very useful in the treatment of children who have been sexually abused. These children will often remain silent for fear of harm or even death. They are often threatened and are in highly anxious states when they come to therapy. The relaxed and interactive setting of sand tray therapy provides them the initial arena of safety that they need to move toward healing. 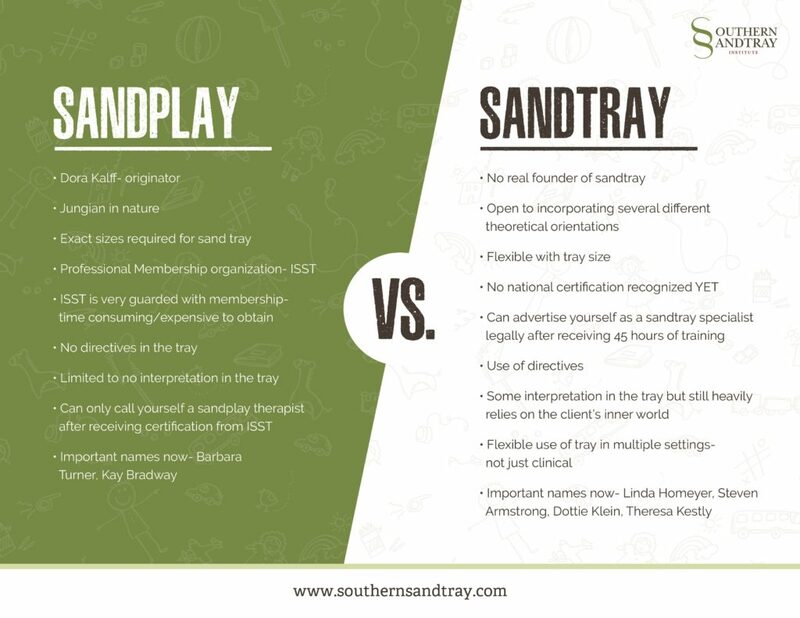 Though sand tray therapy and sandplay therapy both involve the use of sand for therapeutic purposes in a threat-free environment, the approaches have subtle but significant differences. For example, sand tray therapy may incorporate various theoretical orientations, whereas sandplay therapy is grounded in Jungian psychology. Sand tray therapy emphasizes what the person in therapy is experiencing at that moment and therapists are actively involved in facilitating current experiences of awareness and growth. Sand tray therapy is brain-informed and research-based. Much of sand tray work is non-directive play therapy work, which has been repeatedly proven to be evidenced-based. Sand tray therapy uses all of the senses, which encourages the brain to be more integrated and form more neurons. More neurons yields healthier brain function, which yields higher levels of development in skills such as empathy and insight. Sand tray therapy also allows for the left and right hemispheres of the brain to be better connected, again promoting an integrated brain. Sand tray therapy is a RICH experience and often taps into the subconscious. Since the brain processes images first and then attaches language to it, sand tray therapy maneuvers around the defenses people may create in the cognitive parts of the brain.